Retired cop, experienced and reliable critter caregiver, including horses. Hello. Isn't the possibility of a mutually beneficial situation exciting? I am hoping to find repeat or longer duration House And Pet Sitting Jobs that are exactly that - mutually beneficial. I would love to know that someone like me was caring for my pets if I was away. That's easy for me to say, and you don't know me, but my background and references should be able to give you an idea of the professional and responsible person that I am. I am exploring northern Idaho for a future move. My folks live in Idaho and I would like to visit them and friends, and enjoy mountainous areas. I am open to helping at all times of year and a long term live in situation would be considered. I am 54 years young and healthy. I retired after over 22 years with my law enforcement agency in Alaska. 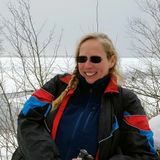 Since 2005, I have worked at our family property management and security company in Upper Peninsula Michigan. I do property management and solely perform bookkeeping for a 30 share condo association. I also do security checks and manage all facets of up to eight lakefront vacation home rentals. I also have about five years of Realtor experience. My love for animals started as a child in Wyoming, growing up on my family's dude ranch with horses, dogs, cats, rabbits, guinea pigs, hamsters, mice, turtles, fish, frogs, and anything else I could talk parents into, except snakes (ew!). My job back then was to care for and train the horses to be safe for dudes and pack string use in the mountains of Wyoming. In my teens and early twenties, I often cared for co worker's homes and pets while they were on vacation. As an adult, I have trained my two dogs, a lab and pointer for hunting, retrieving and ski johring. I have also enjoyed my horse, finches and cats (not the best combination!). I have read material on dog and horse training all my life. I have cared for friend's, dogs, horses, goats and chickens, and have been asked to train their dogs and horses. I am confident in my ability to watch over them and ascertain if they need medical attention. Knowing the love I have for my pets, I will protect and care for yours with that in mind. Very responsible young adult with nothing but respect for other's and their property.